Open Mind Technologies USA, Inc., a developer of CAM-software products, has introduced hyperMill 2018.1, a new version of its advanced, comprehensive CAM software. This version offers a range of new features and enhancements including greater blending capabilities, 3D-optimized roughing, global fitting, rotational abilities for CAD electrode applications and virtual machining simulation. New functionality includes an enhancement to the Soft Overlap feature for blending machining marks found between steep and flat areas, or located at the boundaries of rest machining regions. Using this enhanced feature, the milling tool is briefly lifted to blend milling paths into another, preventing visible transitions from being generated, resulting in better surface quality. Also in this version, the 3D-optimized roughing cycle has been enhanced for applications with high-feed cutters. The step-over distance can be calculated from the scallop height measured against the high-feed cutter geometry. A special tool path movement removes rest material from corners when a large step-over exists. Intelligent cut division and optimized toolpaths provide greater process safety for the remaining thin ridges. 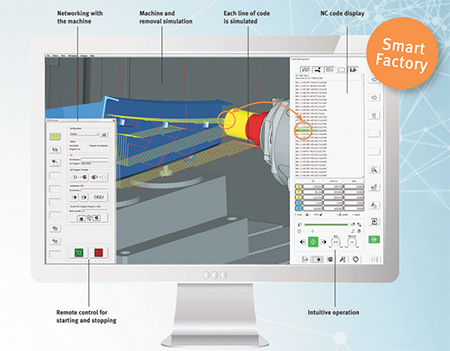 And, developed with Industry 4.0 in mind, an early release of hyperMill Virtual Machining simulation is available in version 2018.1, which enables constant, real-time bidirectional communication between the machine-tool controller and a remote machining simulation, significantly improving manufacturing workflow, according to Open Mind officials. Machining operations can be reliably evaluated, checked and optimized before running a job. See also: Open Mind Technologies USA, Inc.